I finished updating this packet only a couple of days ago and hurried to take some photos to show you all what’s included! So, here we go! PLEASE NOTE: This blog post contains sample pages from my Back to School Math Centers for Kindergarten packet. You can download the free sample pages by click on the photos. 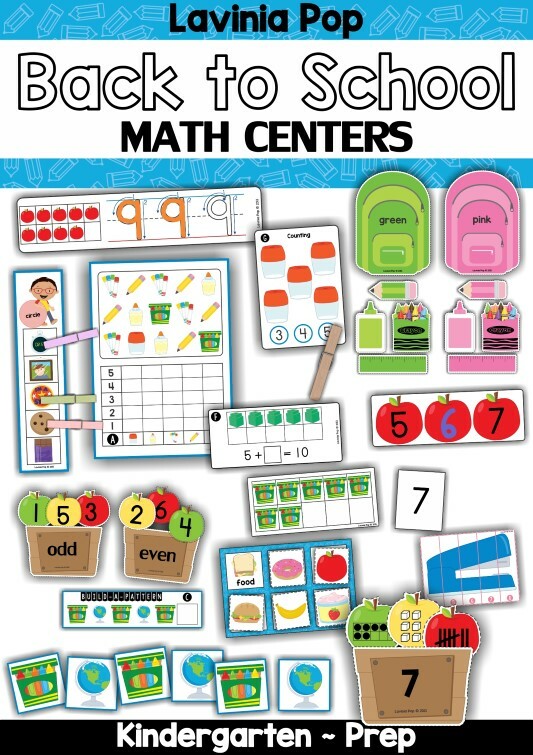 To purchase the complete Back to School Math Centers for Kindergarten packet, please click here! 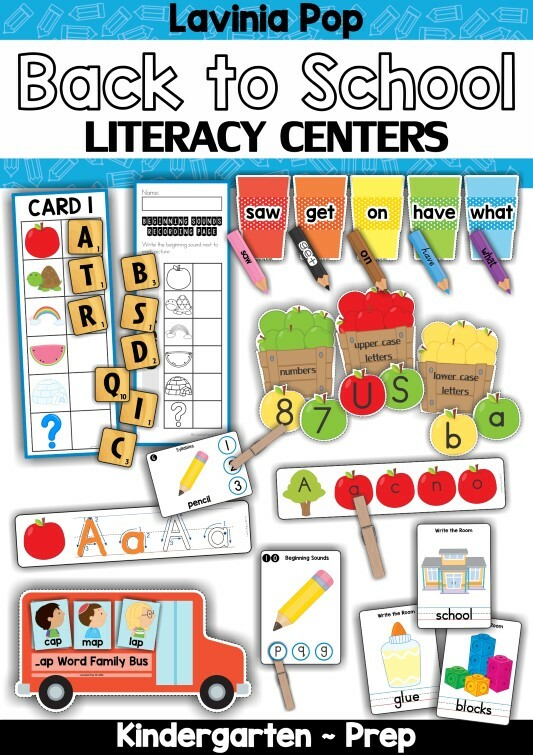 As with all my Kindergarten Centers packet, I have included an “I can” instructions for each activity to remind your kiddos what to do, as well as a cover label that you can put on the front of whatever it is that you are storing your pieces inside. I believe that learning to form letters and numbers correctly from the beginning is extremely important and will save teachers so much headache trying to re-teach it later in the year! For that reason, the first activity is a number tracing activity. I laminated and cut the cards apart, but if you prefer, you can leave the cards uncut and simply laminate the page or slip it inside a plastic sleeve to make an activity that children can use over and over again. Next up, is a count and clip activity. 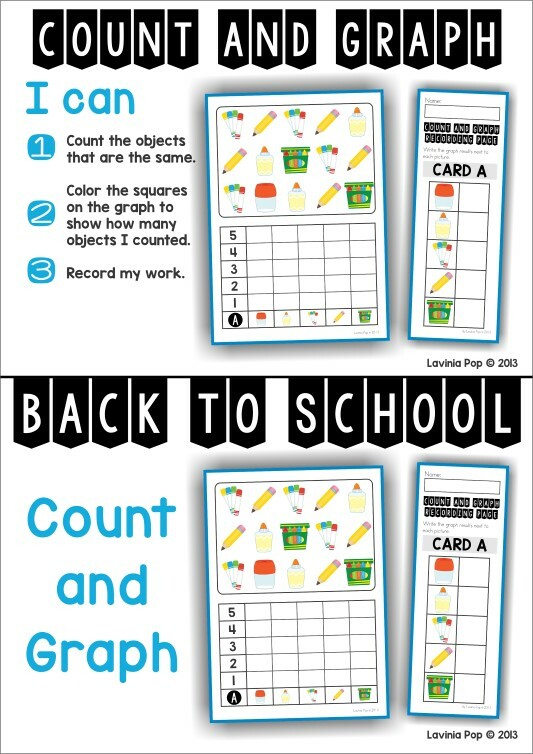 Kiddos simply count the number of items on a given card and clip the correct numeral to show their answer. Using pegs is fantastic for helping kiddos to develop those little finger muscles in preparation for writing! I have included recording pages for each of the activities in this packet; however, there’s no drama if you decide not to use them! Then, there is a Missing Number activity. If some of your kiddos are struggling to write numbers, provide them with small magnetic number for the activity and then number stamps to record their answers on the recording page. The next activity is a pattern building activity. I included 4 pattern types (AB, AAB, ABB, AABB), but if your kiddos are struggling to understand them all so early in the year, you can whip them out later on! Representing data on a graph isn’t really all that complicated; it’s just another way of showing “how many” your kiddos counted. Next up, is a simple ten frame and number matching activity. Ideally, you want your kiddos to have so much practice with this that as soon as they see a ten frame, they will automatically know the number represented. I have also included some number puzzles. The aim is for kiddos to identify the smallest number and begin the number sequence from there. You know how I was saying that it’s important for your kiddos to automatically recall the number represented on a ten frame? Well, a reason for that is that it helps with addition to ten. 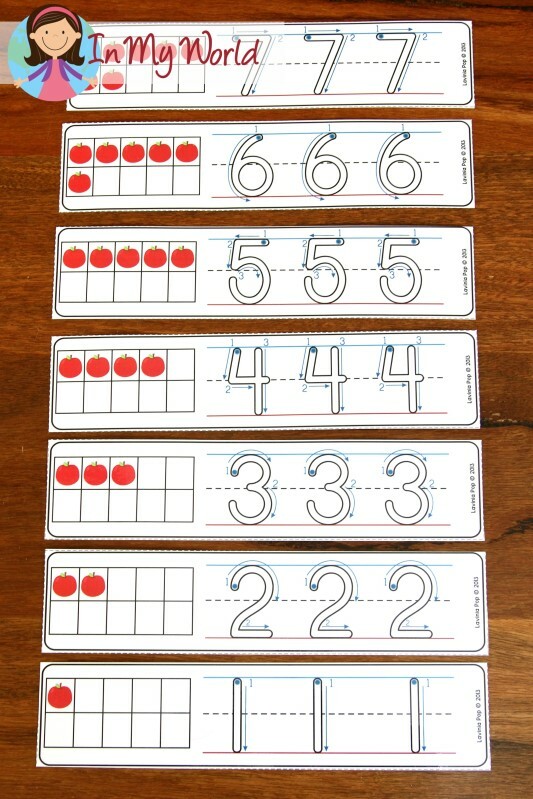 For this activity, children are required to represent on ten frames the different ways to make 10. I have also included an odd and even number sort. The numbers go up to 24, so you could always practice number order with these cards too. Another sorting activity is this one where kiddos sort the picture cards to show whether they are supplies, children, teachers or food. Next, I included a color sorting activity. Very simple, but a good way for children to learn color words! Then, there is a 2D shapes in real life activity. And last is a number sense activity with each number represented on a ten frame, as base ten blocks and as tally marks. Children simply sort the different “ways to show the number” to the different crates and then record their answers. Well, there you have it! My Back to School Math Centers for Kindergarten. If you like the look of these activities and would like to purchase the complete packet, please click here or on the picture below. If you need a matching literacy packet, you can read about it here or purchase it by click on the picture below! So excited about the samples!! I love this idea. N3d this for my special needs child. I love this material and I would like to have all the flashcards because I really need them to work with my children. Where can I get the fonts for the black and white banners on the worksheets?